The seven deadly sins, also known as capital vices, is a group of behaviors or practices which lead to other destructive actions and activities. Innumerable sermons, lectures and scoldings have resulted from each of these offences. Envy, the fault of obsessively desiring a possession or quality of another person, is on this list of cardinal sins and is usually associated with the color green. In nature there are many trees and plants with unique and enviable qualities desired by humans. Wakulla County has its own green tinged champion for many of the residents. The native Southern Red Cedar population is high on the list with residents, human or otherwise. The Southern Red Cedar is a common and rarely noticed juniper, at least by the area’s human residents. It grows wild in forested areas and is occasionally used as a landscape specimen or windbreak. There are other cedars and members of the juniper family which have been transplanted into the area, including the closely related Eastern Red Cedar. All have been used as landscape enhancements. For the area’s moth population, the presence of cedar is a story with an unhappy ending. Southern Red Cedar lumber or shavings is the only natural, native reason to find other lodgings, but many of the non-native junipers also produce the compound cedrol which wards off insects. The annals of history do not identify the person who first realized cedar wood is bad news for moths. No doubt it was someone who had a wool sweater and was weary of local moths’ preference for this textile. The discovery proved popular and created a niche furniture industry. Cedar chest, cedar lined closets and bags of cedar shavings all were used to eliminate moth damage and add the sweet scent to the woolens. Wool was an important addition to any cool season wardrobe because it is the only natural textile which can get wet and keep the wearer warm at the same time. Unfortunately, cedar could not withstand the rigors of sea travel and saltwater. In the days before synthetic moth repellents, sea chests were made from camphor wood. This native of southeast Asia did withstand exposure to seawater and repel moths, but with a very distinct and strong odor. Another insect pest which is susceptible to cedar is the carpet beetle. Like moths, they have a distinct preference for wool products, but will consume a number of other animal derived items used in upholstery, clothing or floor coverings. The newly hatched larvae will die upon exposure to cedar, but mature insects are only repelled. Additionally, the cedar must be fresh to work effectively. The development of synthetic repellents and textiles in the 20th century dramatically lessened the demand for cedar as a timber product. Still they have an important function in Wakulla County’s environment. The native Hairstreak butterflies are dependent on southern red cedar as a food source. Birds and a variety of wildlife species utilize the cedar berries as a seasonal food source. Even the occasional ornamental pest, bagworms, will shelter in and dine on southern red cedar foliage. The envy of constructive qualities can be a matter of perspective, but not likely a deadly sin for the inhabitants who appreciate the Southern Red Cedar. 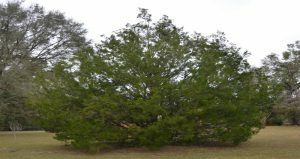 To learn more about Southern Red Cedar and its uses in Wakulla County, visit the UF/IFAS Wakulla County website at http://wakulla.ifas.ufl.edu or call 850-926-3931.